Beginning college writers come from a wide range of backgrounds and communities. And for many, academic reading and writing skills are ones they must learn and practice. Enter Rules for Writers. It’s an easy-to-use, comprehensive composition tool with the quality you expect from authors you trust. It empowers students by teaching them how to meet new expectations and by giving them the practice that builds confidence. 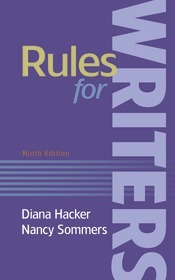 With trusted advice for writing well, reading critically, and working with sources, Rules for Writers now has even more help for underprepared and inexperienced writers—sentence guides that foster an academic voice, tips for spotting fake news and misleading sources, more on paraphrasing, and fifteen new “how-to” pages that offer practical help for writing challenges. It’s an affordable solution with significant value, especially when paired with LaunchPad Solo for Hacker Handbooks, an innovative practice solution available at no additional cost when package with a new text.